Tesla and SpaceX founder Elon Musk owned the news yesterday when he released the initial design for the hyperloop, a new form of transportation that would take passengers between San Francisco and Los Angeles in 35 minutes. The system would use pillows of air to shoot pods through tubes at 800 miles per hour. 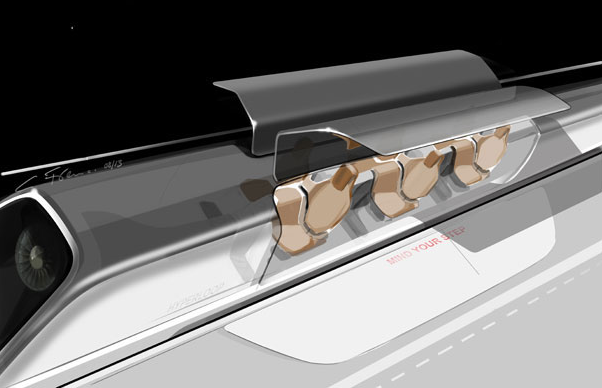 Musk’s design was presented in a 57 page document packed with details about every aspect of the hyperloop’s construction and ride experience. Obviously everything is hypothetical and a future developer could drastically change the plans, but let’s take a look at the document as is. Here are five details worth noting. It wouldn’t go to downtown San Francisco or L.A. 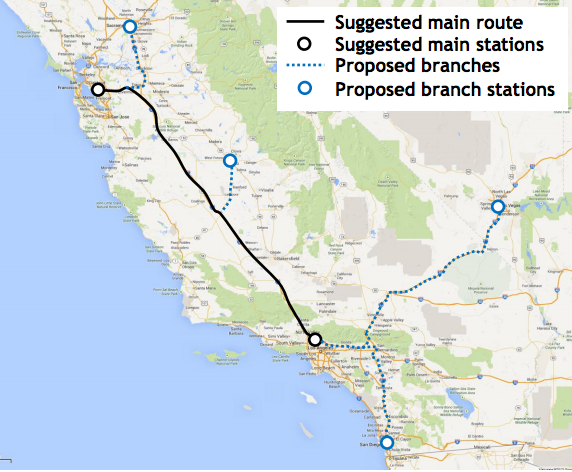 The design document suggests that the main hyperloop stations fall outside of downtown San Francisco and L.A. From the map, it looks like the Hayward area between Fremont and Oakland east of San Francisco and the Glendale area just north of L.A. host the designated stations. That’s not surprising. While it would be a challenge to negotiate land for raised tubes to run along hundreds of miles of highway and farm land, it would be an even bigger challenge to deliver those tubes right into the heart of two densely developed cities. The hyperloop is also meant to be straight, which would leave little flexibility for a roundabout travel path. It’s not the end of the world. People already travel outside the cities every time they need to go to the airport. But traveling from downtown San Francisco to Hayward by BART takes at least 30 minutes. If the idea of the hyperloop is to make travel dramatically more convenient, it would be a shame to double or triple travel time due to the location of the stations. Boarding might be less of a hassle than at an airport. Maybe. In a nod to his PayPal days, Musk has decreed that all hyperloop ticketing and baggage tracking would be paperless. Like at an airport, passengers could bring up to two bags that together weigh 110 pounds (no word on plans for exorbitant baggage fees). Station staff would load and unload baggage into removable compartments that fit into the rear of the hyperloop pods. This means they could be prepacked and then quickly slipped into a pod before departure. Up to three pods could be loaded and unloaded with passengers and baggage simultaneously to speed departure and arrival times. A maximum of 70 pods could be traveling between San Francisco and L.A. in one direction, which means a new one would depart every 30 seconds. That would give people 1 minute and 30 seconds to board and depart the station. It’s hard to imagine that going smoothly consistently. Frequent delays seem likely. 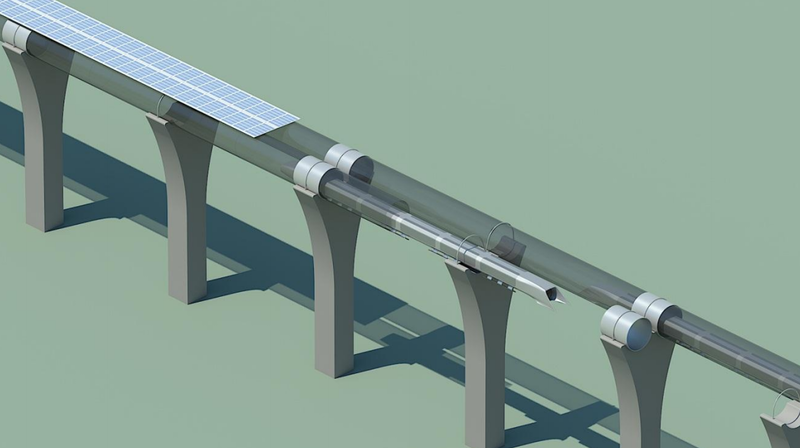 Musk has previously said that the hyperloop would be impossible to crash. Yesterday in a press call, he revised that statement to say it would be nearly impossible. While the tube would be immune to weather like ice, wind and fog and the entire system is expected to be built to last 100 years, malfunctions could still occur with the tube or a pod. The design document recommends actions for several scenarios. Pod depressurization: The air inside the tubes is kept at low pressure, while the air inside the pods maintains regular pressure. In the case of a pod depressurizing, oxygen masks would drop from the ceiling like on an airplane. If multiple pods lose pressure, all of the pods in the tubes would brake and the tube would undergo a rapid increase in pressure to make the air safe for humans. Pod stranded in tube: The pods spend most of their journey coasting and only receive an occasional boost from a motor to keep up their speed. If one happened to stop somewhere along the tube, pods up ahead would continue on their journey. Pods behind it would stop to avoid a collision. Then they would all deploy built-in wheels and use an on-board motor to complete the trip. “Human related incidents”: It’s possible the hyperloop would make a nice target for terrorists, as it would be hundreds of miles long and stuck in place. Each station would incorporate airport-level security, but there isn’t a plan for how the tubes would be protected. The document notes that placing them on pylons up to 100 feet tall limits access to their critical components. Having to scale a concrete pillar isn’t going to stop everyone though. Earthquakes? like in mexico city? Check out the segundo piso… they seem to have figured it out. Anyone with a basic engineering or science background know that building a bridge (the hyperloop is basically a 300 mile bridge) is harder and much more expensive than building something that sits on the ground. In California the seismic requirements for such a bridge would be hugely more expensive to build. This guy has his arrogant head up his keister. If it carried cars it would have to even bigger and stronger. In California we pretty much have constant micro quakes keeping the thing perfectly aligned to allow pods traveling at the speed of sound would be impossible. Our train tracks have to checked for alignement on a daily basis. We cannot build leakproof underground stormwater pipes because of the cracking and misalignment caused by regular microquakes. There is no perfect destination station. You might live in San Francisco, I do not. In fact, San Francisco is home to a very small fraction of Bay Area residents. This is no different from the way airports work. And SFO is not anywhere near downtown San Francisco. There is no perfect single destination station for a solution like this. You might live in San Francisco, I don’t. In fact, as a portion of Bay Area residents, San Francisco represents a very unimpressive fraction of them. Along with the passenger system he also proposed a version that would ferry people’s cars. It would be a bit bigger and cost about 10% more. Is it possible to build the same system but for regular cars instead of pedistrians? And place stations outside of the cities.